I n the aftermath of the Stock Market Crash of 1929, timberland was recog- nized as a rock-solid asset with strong upside potential. One of Hall's most famous clients, Alfred I. DuPont, charged him with finding potential timberland investments both in state and out of state. (DuPont's vast Florida holdings would become the foundation of the St. Joe Company.) 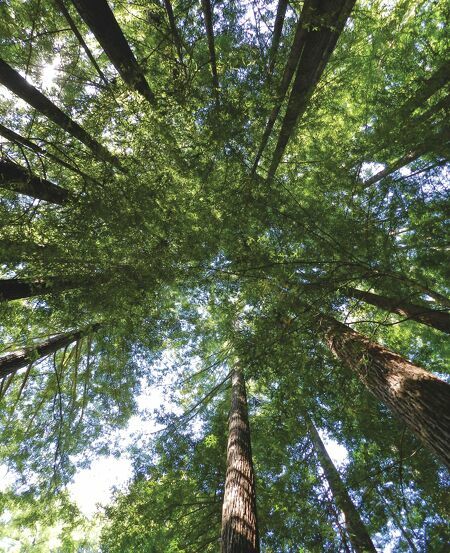 "Hall found the 30,000-acre Gualala Redwoods and fell in love with it," recalls J. Ollie Edmunds Jr., M.D. "He went back and told Mr. DuPont, who turned it down. But Mr. DuPont encouraged the others to buy it, which they did." The three formed a general partnership, with Hall staying on as resident partner and the others returning back East to pursue their careers. 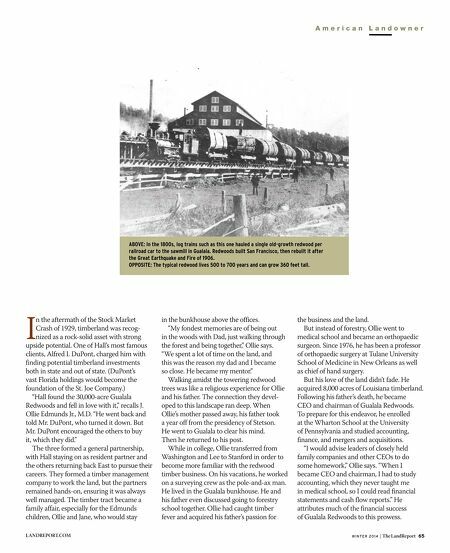 They formed a timber management company to work the land, but the partners remained hands-on, ensuring it was always well managed. The timber tract became a family affair, especially for the Edmunds children, Ollie and Jane, who would stay in the bunkhouse above the offices. "My fondest memories are of being out in the woods with Dad, just walking through the forest and being together," Ollie says. "We spent a lot of time on the land, and this was the reason my dad and I became so close. He became my mentor." Walking amidst the towering redwood trees was like a religious experience for Ollie and his father. The connection they devel- oped to this landscape ran deep. When Ollie's mother passed away, his father took a year off from the presidency of Stetson. He went to Gualala to clear his mind. Then he returned to his post. While in college, Ollie transferred from Washington and Lee to Stanford in order to become more familiar with the redwood timber business. On his vacations, he worked on a surveying crew as the pole-and-ax man. He lived in the Gualala bunkhouse. He and his father even discussed going to forestry school together. Ollie had caught timber fever and acquired his father's passion for the business and the land. But instead of forestry, Ollie went to medical school and became an orthopaedic surgeon. Since 1976, he has been a professor of orthopaedic surgery at Tulane University School of Medicine in New Orleans as well as chief of hand surgery. But his love of the land didn't fade. He acquired 8,000 acres of Louisiana timberland. Following his father's death, he became CEO and chairman of Gualala Redwoods. To prepare for this endeavor, he enrolled at the Wharton School at the University of Pennsylvania and studied accounting, finance, and mergers and acquisitions. "I would advise leaders of closely held family companies and other CEOs to do some homework," Ollie says. "When I became CEO and chairman, I had to study accounting, which they never taught me in medical school, so I could read financial statements and cash flow reports." He attributes much of the financial success of Gualala Redwoods to this prowess. W I N T E R 2 0 1 4 | The LandReport 65 LANDREPORT.COM A m e r i c a n L a n d o w n e r ABOVE: In the 1800s, log trains such as this one hauled a single old-growth redwood per railroad car to the sawmill in Gualala. Redwoods built San Francisco, then rebuilt it after the Great Earthquake and Fire of 1906. OPPOSITE: The typical redwood lives 500 to 700 years and can grow 360 feet tall.